PLEASING THE PALATE: "I enjoy the restaurant business because you meet a lot of interesting people. You can learn a lot. It's a way to learn about American culture; and also, we can pass our customs and traditions to the American customers. We like to introduce ourselves to the community." James Qin, owner of Shanghai Park, is shown in his attractive new restaurant. I grew up with Shanghai food. I can tell the difference if it's really authentic." 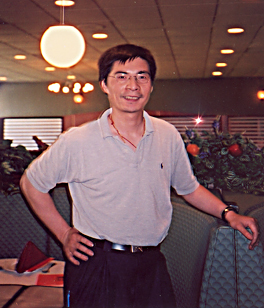 James Qin, owner of the new Shanghai Park restaurant in the Princeton Shopping Center, is very proud of the quality of the cuisine, which specializes in Shanghai dishes and Japanese sushi. FAMILY FUN: "We thought Princeton could benefit from this, and the Shopping Center was looking for children's activities. It's really geared toward family entertainment all across the board." 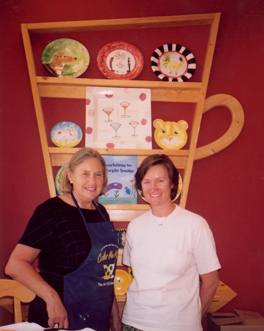 Katherine Woodfield (right), owner of Color Me Mine: Paint Your Own Pottery, is shown with her mother and manager, Rosemary Woodfield, in front of a display "teacup", featuring a variety of items that have been painted. Who would have thought that painting your own pottery could be so much fun? That is exactly what kids from three and up, along with older brothers and sisters, dads and moms, aunts and uncles, and grandparents have all discovered at Color Me Mine in the Princeton Shopping Center.